Middle ear infection (otitis media) Otitis media is an infection of the middle ear common in younger children. Most ear infections occur in infants aged 6-18 months, though anyone can get an ear infection.... I went back to work yesterday, but ear and sinus are still blocked most of the time (I do get occasions of ear clearing and hearing back for about half an hour, then it goes again). I've been using beconase spray, which seems to damp things down a bit. Keep popping your ears and get that liquid out. Its just time it seems. And you do get use to it if you are not in a panic state. Still dealing with mine but the anxiety has lessened and the more that subsides the ringing is either less or more tolerable. You will be fine. Best of luck to you. The infection may spread into the mastoid bone behind the ear (mastoiditis), or pressure from fluid build-up may rupture the eardrum or damage the bones of the middle ear. Young children with otitis media may be irritable, fussy, or have problems feeding or sleeping. When they occur, it is because fluid is trapped behind the eardrum in an area called the middle ear. This fluid causes painful pressure, the main symptom of an ear infection. 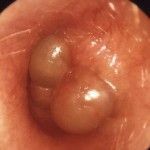 This fluid causes painful pressure, the main symptom of an ear infection.